ROMANCE: RObust Metabolomics Analyses with Normalized CE. Please contact us if you are interested in the source code. 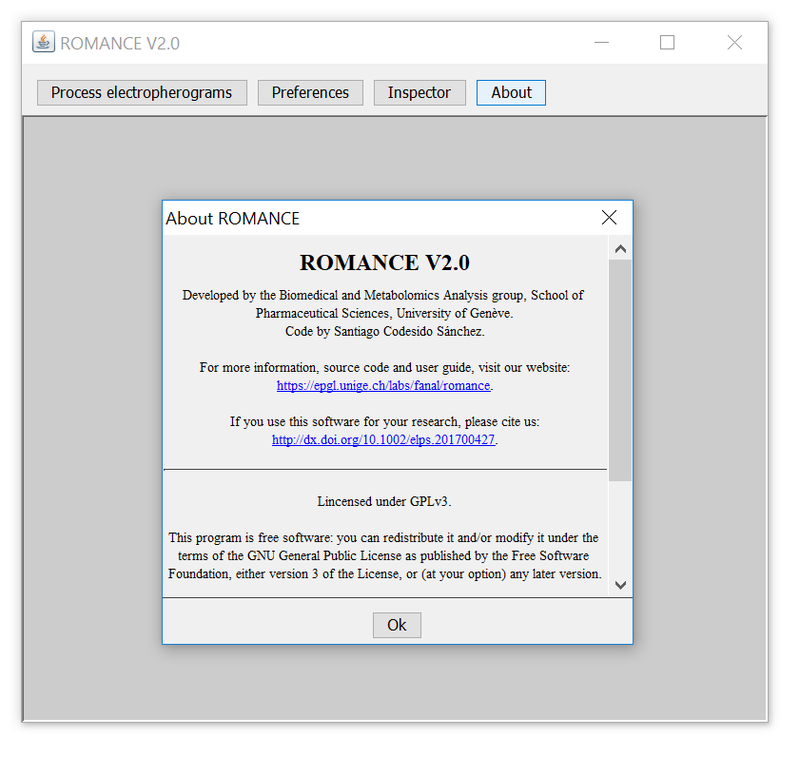 ROMANCE is multi-platform and can run on any operating system. However, the latest version of the Java Runtime Environment is required (min JRE 8). ROMANCE can automatically convert batches of CE-MS files from the time scale into the electrophoretic mobility scale. It works with the new standard mzML format for MS data, so it can be transparently incorporated into any existing data treatment workflow. The software accepts MS(/MS) data in both centroid or profile format. The software can convert data by using the separation voltage, capillary length and m/z of a marker peak. Such marker can be either a neutral molecule (EOF marker, electrophoretic mobility = 0) or a known mobility compound. The converted files are written in the electrophoretic mobility scale, thus correcting most of the experimental sources of variation and making possible intra- and inter-laboratory comparison and data exchange, provided that the same BGE is used. Prof. Jean-Luc Veuthey et Dr Davy Guillarme have been awarded by the UK chromatographic society with the Martin Gold medal and Silver jubilee medal, for their innovative works in the field of separation sciences. Our collaborator Julie Schappler has left the University of Geneva for new perspectives since July 1st 2018. We wish her the best for the future. A new educational tool was developed in the laboratory for basic principles of liquid chromatography. Feel free to download and use for your training.